We chose to address the issue of unfair labour and sweatshops because earlier this year a factory in Bangladesh collapsed due to unsafe working conditions and many lives were lost. We also came to realize that many of the brands we support use these sorts of sweatshops to manufacture the clothing we wear. We wanted to try to put this issue into perspective for the students at our school so that they realize that all of our decisions are affecting others around the world. By giving into sweatshop labour, we are compromising the rights of millions of individuals around the world. From May 27th to the 31st, we went around to period five classes, and did presentations to tell the students about our campaign we’d be running the following week. For the campaign we decided to sell fair trade items and donate the money we raised to MCIC, Manitoba Council for International Cooperation. They will donate the money to a fair trade organization on our behalf. Our table was a success and by the second day we had sold $160.00 worth of fair trade products. Goods were flying off the table and we had to call MCIC for more! By the end of the campaign we had raised over $400.00 and we are so proud! 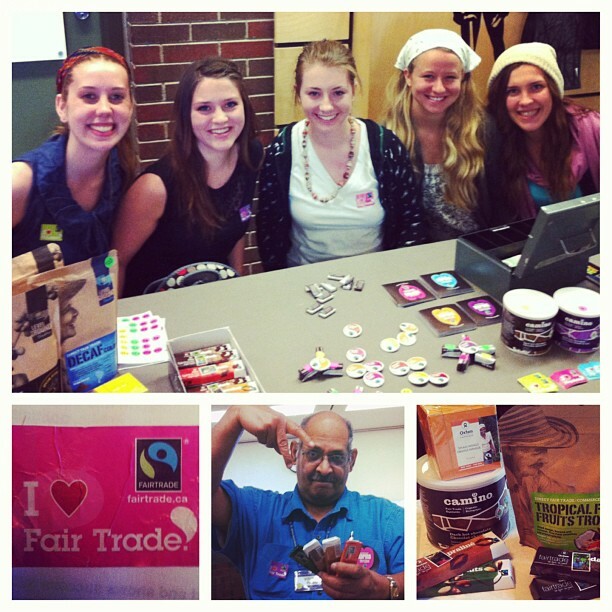 Many of the students and teachers were super supportive and were really interested in fair trade options. We decided to donate our $400.00 to La Siembra Co-operative, who own the fair trade brand Camino©. La Siembra works directly with 23 producer co-ops, which support more than 39,500 farmers in over 11 different countries. Their vision is a world where people build vibrant global and local communities. We’d like to thank the students and staff of Sturgeon Heights for their support in making the campaign a success! We’d also like to thank MCIC for supplying us with fair trade products and for all their help along the way.